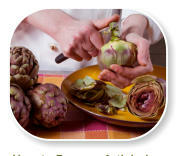 Evidently the globe artichoke is not the preferred vegetable to enjoy cooking! These uppity and sophisticated vegetables are so peculiar in appearance that they seem daunting and intimidating to prepare. Their complex exterior has caused much confusion because of their armoured bracts (leaves). It appears that nature has created its own architecturally designed vegetable with its remarkable colours and contours. This tasty globe possesses many layers of involucral bracts, a delicious heart and a meaty stem; all of which are edible and taste differently. 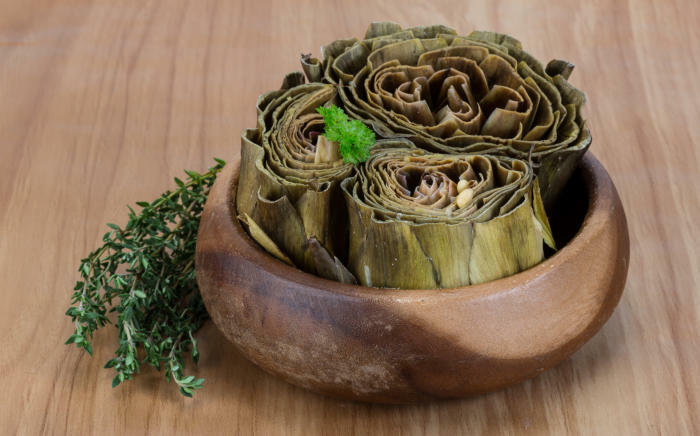 The globe artichokes stand proud in their fields with their head held high; it is not surprising that these noble vegetables were considered food for the elite many centuries ago. Preparing the globe artichoke for consumption seems difficult, messy and time consuming and eating it may be slow, but only once you have experienced this unique and tasty vegetable will you understand why the artichoke is regarded as an aristocratic vegetable. Consummation should be slow and enjoyable! 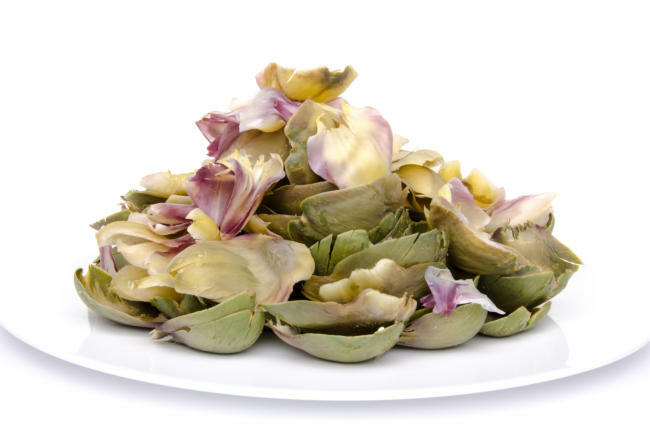 The globe artichoke can be cooked whole or chopped and used in your favourite dishes including pastas, risottos, pizza toppings and frittatas. The only limitation is your imagination! 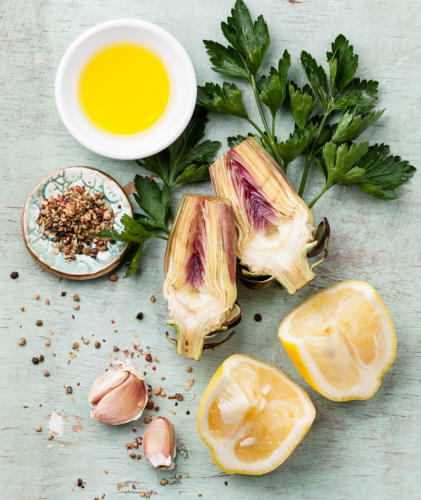 This unique vegetable fuses perfectly with lemon, garlic and parsley – making the combination a superfood. 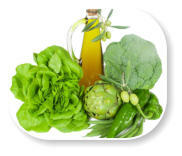 These ingredients all contain high amounts of Vitamin C which boosts the immune system. 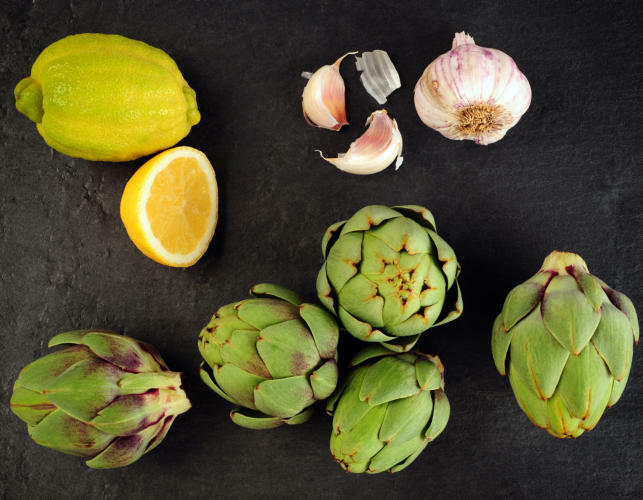 The globe artichoke is a rare vegetable as almost the entire vegetable is edible, but furthermore different parts of the artichoke have diverse flavours. Not only is each individual bract enjoyed, but once you think you have savoured an amazing taste experience, you will then reach its heart which will provide a pleasant surprise and also offers a different flavour. Do not discard the stem. This meaty section is also worth trying, again giving a different texture and taste, and is also packed with vitamins. 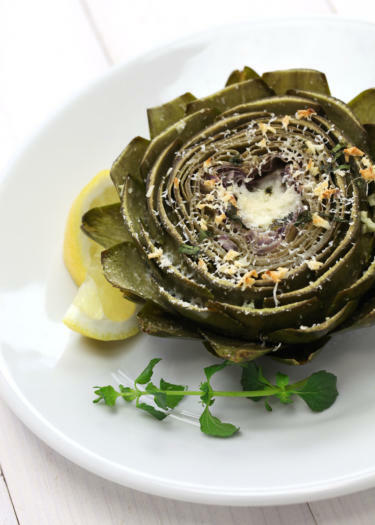 The globe artichoke lover will agree that this is the only vegetable that must be eaten with your hands – forget the rules of etiquette! When in the company of wonderful friends and a good red wine, it is only typical to share this delicacy patiently while socialising, making the occasion a relaxed and enjoyable atmosphere. Once cooked, the individual leaves are pulled off one at a time to eat them making the eating process a slow one. 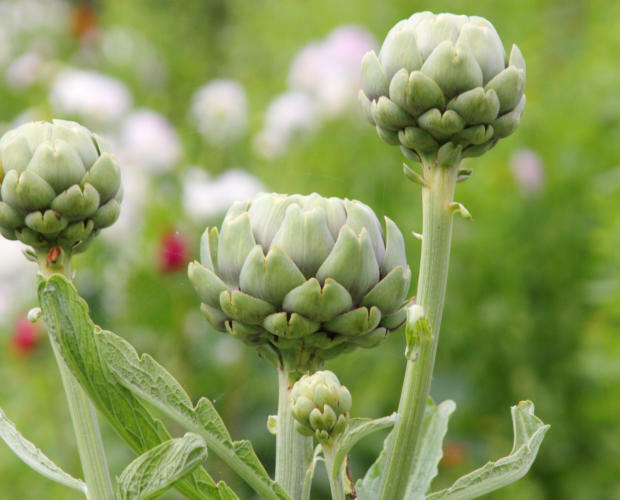 When dealing with matters requiring patience, the Italians have a motto ‘the strategy of the artichoke’ which means that they deal with challenges patiently one at a time, similar to the bracts of the artichoke bud. Most chefs will serve the globe as an entrée so their guests can socialise while slowly enjoying its diverse flavours. 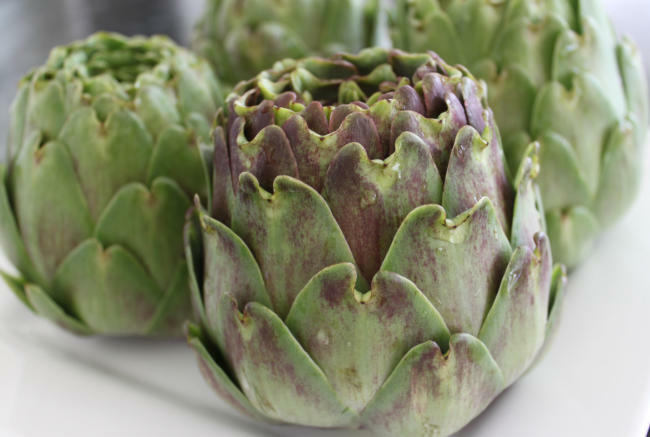 The globe artichoke is similar to a lobster or pomegranate; it takes some effort to eat, but the flavour is well worth any effort! Each bract/ leaf is either dipped into a sauce or previously stuffed before cooking. 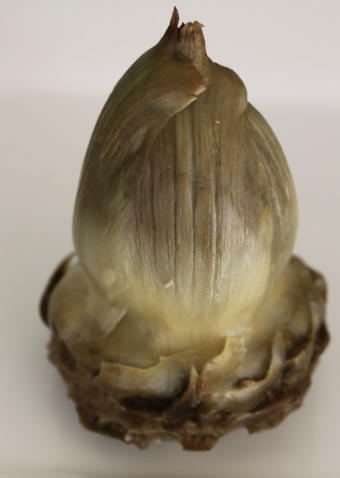 It is eaten by biting gently down and slowly pulling the bract through clenched teeth to scrape of the fleshly, succulent edible portion of the globe artichoke. The remaining bract is then discarded. Italians usually have a large communal bowl placed in the centre of the table where all guests place the discarded bracts sharing this eating process but others use individual smaller bowls. 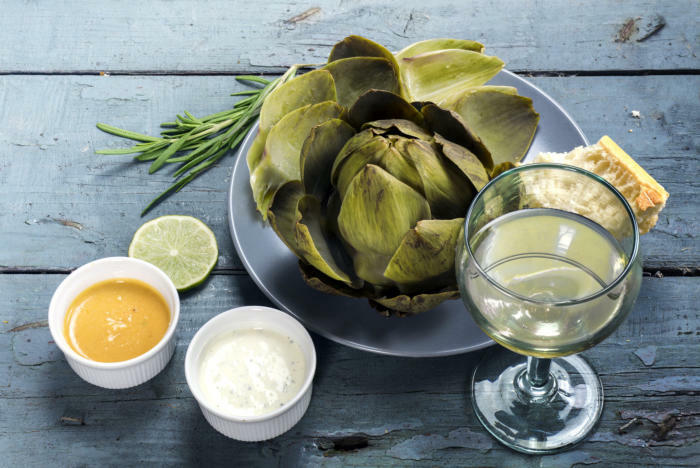 The globe artichoke can be either stuffed with a diverse variety of recipes or there are many sauces for dipping the bracts; they vary from flavoured mayonnaise, salad dressing, vinaigrettes or flavoured melted butter. 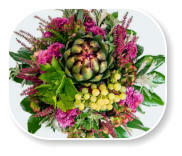 You will find that the bracts are tenderer and smaller closer to the centre of the globe with a larger portion of edible flesh. Also, the smaller bracts closer to the heart will have a different flavour to the outer bracts. Once all the bracts have been removed and eaten you will come to the choke which is a hairy, fuzzy, inedible matter which protects its sweet, tender heart. 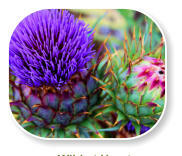 The size of this spiky fibre will depend on the maturity of the globe artichoke and which season it was picked in. 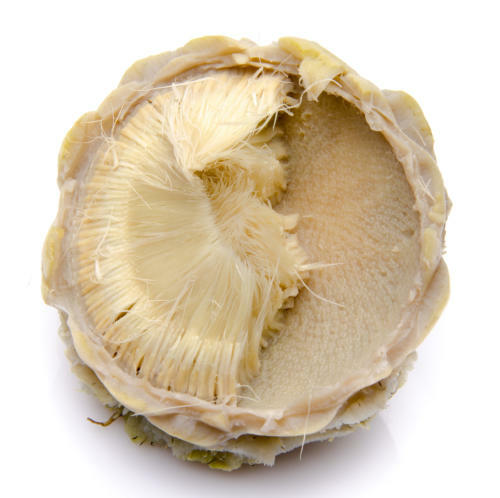 Simply remove this to reveal it’s reward; the artichoke’s succulent heart. 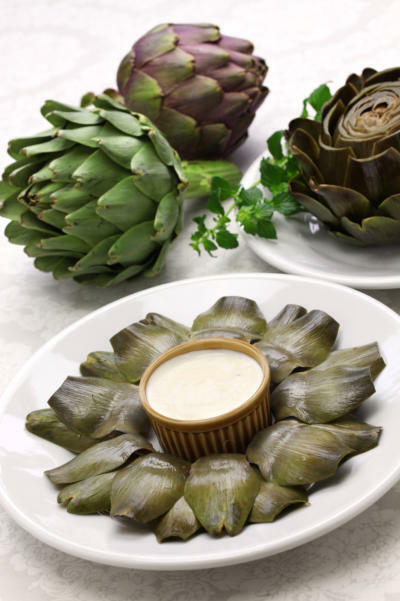 To most artichoke lovers, this is the best part of the artichoke which was definitely worth waiting for. The heart is a tender, succulent and very flavoursome meaty section which can be eaten as is, or dipped into your favourite sauce. 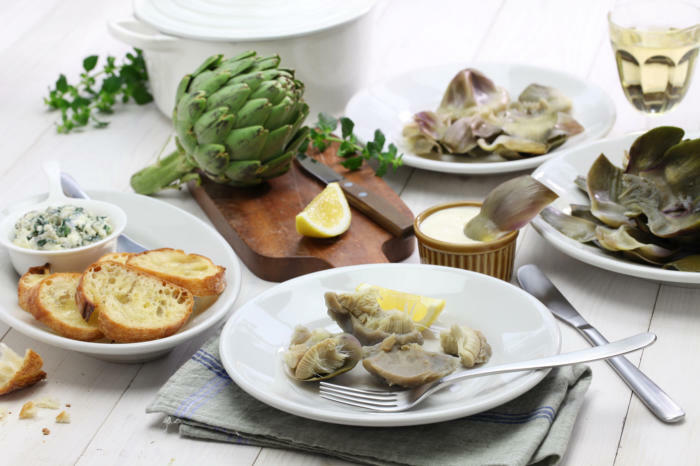 Many Italians restaurants are now including artichokes in their menus and consumers are slowly becoming more familiar with their unique flavour. Unfortunately they are still not as common as in Europe or its neighbouring countries where they have been recognised and consumed for many, many years. 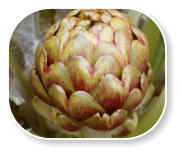 The artichoke is a prized vegetable in Italian, French and Arabic cooking. 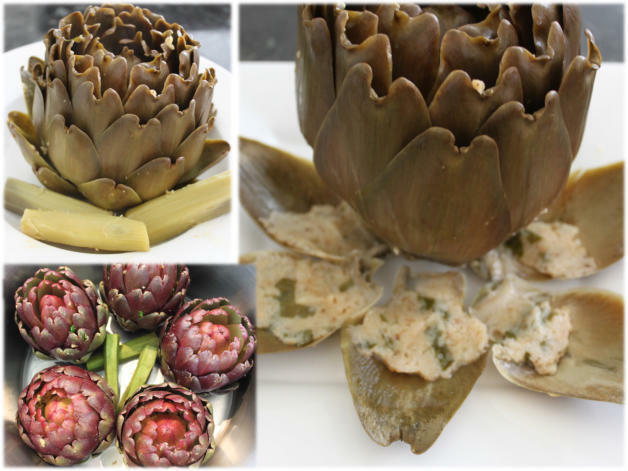 In California, USA, they sell globe artichokes in almost every bakery, restaurant, supermarket or greengrocer. For decades the Californians have long embraced this vegetable making it a vital component of their weekly diets. 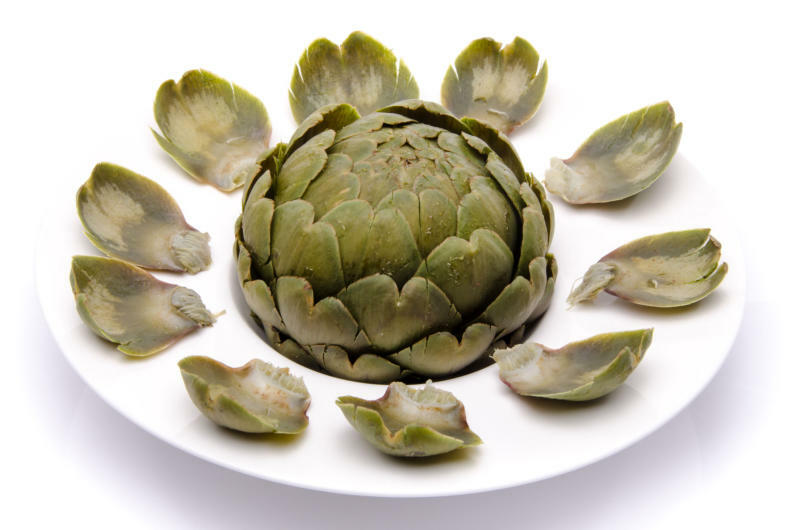 They not only enjoy their distinctive flavour but are also aware of the globe artichokes’ amazing health properties, which they continuously promote. Californians also sell these globes previously washed, prepared and packed in microwavable plastic bags for easy cooking. 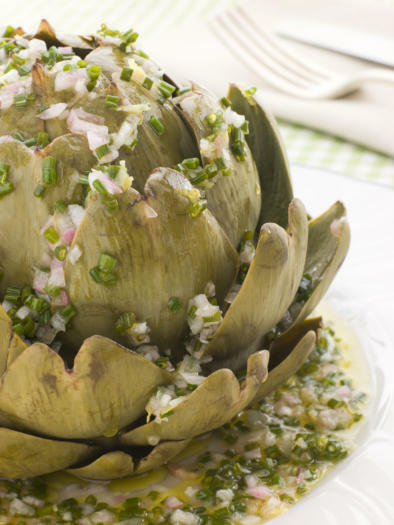 So loved are the artichokes in Californian that they have annual festivals based around these globes at which they display many different cooking methods. 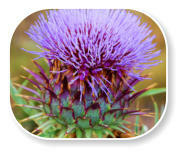 The globe artichokes health benefits are numerous. It is crammed with antioxidants, helps liver function, can fight high cholesterol levels and contain a good source or iron, magnesium and potassium. 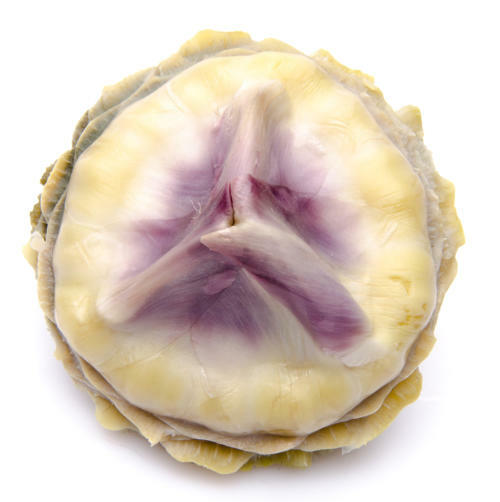 Globe artichokes are a healthy source of protein, ideal for vegetarians. For these reasons we should include this imperial vegetable in our weekly diets!